Saint Mary’s, Mundoonan was built 1911. This paddock church was built on land given to the parish by the Davis family, some of the earliest Europeans to settle in this area. 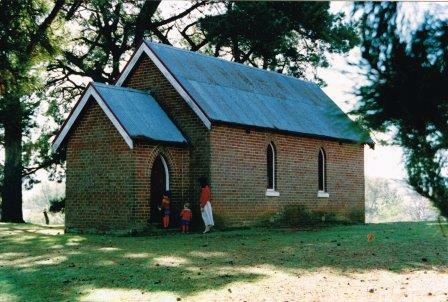 It is believed that a small wooden one existed prior to the present brick church the foundation stone of which was laid on 29 October 1911 and licensed 1/2/1912. The Vicar-General, Archdeacon Bartlett, dedicated it on 4/2/1912. It is built of brick, measuring 12m * 5m, with a porch, and seats 48 people. Plaques, a mural, sanctuary and Bishop’s chairs, and vases in the church commemorate those from the community who served and fell in the two world wars. Altar lights of brass came from Mary Davis, an original settler, and were given by Mrs. W. Buckmaster. The timber panelling and reredos were originally in the Jeir church. The present altar, given in 1953, is in memory of William and Marion Buckmaster, long-time members of the congregation. Is your family connected to this Parish? Please prove you are human by selecting the Diamond.